Olive oil and coarse salt. Tools: marble mortar and wood pestle or food processor. – peel the garlic and wash the spinach leaves. – pound the garlic and the spinach leaves in a pestle and mortar with a few grains of salt. – add parmesan, pecorino romano cheese, a sprinkling of black pepper, a little olive and mix all well. 2) Cut the feta cheese into cubes. 3) Combine the pesto and feta cheese in a large bowl, leaving aside a few cubes of feta for decoration. 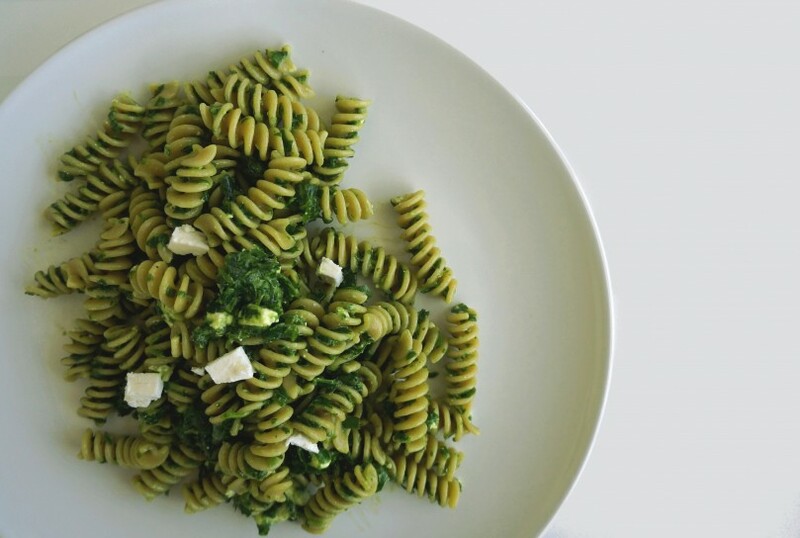 4) Cook the pasta in salted water, drain it al dente and mix with pesto immediately so that feta melts slightly. 5) Garnish with cubes of feta and serve.